In 1886, Gottlieb Daimler and Carl Benz invented the motor car at almost the same time. Since then, this date is considered all over the world to mark the genesis of the automobile. 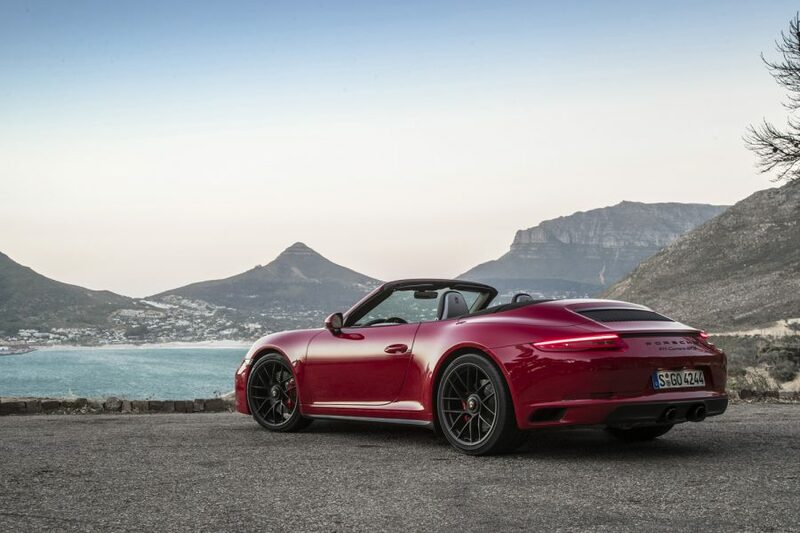 German cars are world-famous and synonymous with quality and innovation. Their manufacture is not only a key economic factor; production plants are also popular visitor attractions as well as serving as venues for cultural events. Prestigious museums offer an insight into the development of automotive manufacturing, and visitor centers make the cars of today accessible to the public, sometimes quite literally. Germany is also home to international motorsport events. For those who prefer to take life at a more gentle pace, the many themed scenic routes in Germany offer an ideal alternative. Nürburgring and Hockenheimring are the most famous race tracks in Germany. Both allow people to experience the track either by ride along with a professional driver or drive yourself. On Nürburgring you can also take your own car with you. Well, may be not your rental car but if you bought a Porsche, Mercedes, Audi, oder BMW and pick that piece up in Germany they might offer you in their package a ride on the Nürburgring. Or you want to do it on your own. Check out our page Racetracks in Germany. Museum location: Address: Am Olympiapark 2, 80809 Munich (The half-round building next to the BMW 4-Zylinder Main Building). BMW Welt location: west of the museum. Am Olympiapark 1, 80809 Munich. 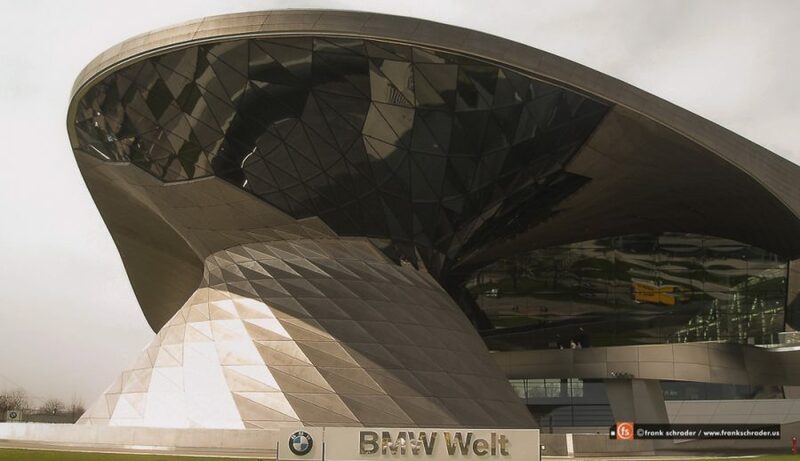 With guided tours for individuals or groups, visitors can see BMW Welt, the Munich plant and the BMW Museum: an opportunity to immerse oneself directly in the world of BMW. By car: located at intersection of Mittlerer Ring and Lerchenauer Strasse, north-west corner of the Olympiapark. Driving time from the main train station approx. 20 minutes, from the airport approx. 45 minutes. Parking (parking fee payable) is available in the underground car park at the BMW Welt. A bus park (parking fee payable) is located at the ice sports stadium on the adjacent Olympic complex (access via Lerchenauer Strasse). By public transportation: Take the U3 subway train from the city center to the stop “Olympiazentrum”. We recommend that you take the path via BMW Welt and cross Lerchenauer Strasse using the pedestrian bridge. At its widest, the opening between the monolith’s underside and ground level is ten metres high, reinforcing the sense of spaciousness in the area in front of it. It houses the exhibition area proper, the “Christophorus” restaurant and the event zone with roof terrace. Crouched beneath the monolith is the base building, which welcomes visitors to the Porsche Museum with an inviting gesture. It accommodates the lobby, museum workshop, archive, Bistro, Coffee Bar, museum shop, cloakroom and pay desks. The way the base building’s roof shape rises away from the entrance creates space for a second story, in which the archive’s reading room can be seen. Both structures are linked by a partially glazed, dynamically angled stairway and an elevator. Visitors access the exhibition space measuring some 5,600 square meters in the upper part of the building via an escalator. They now have the choice of starting their tour with a chronology of the company’s history prior to 1948, or proceeding directly to the main section of the exhibition by following the product chronicle post-1948. The Mercedes-Benz Museum and the Mercedes-Benz Centre opened its doors in May 2006. 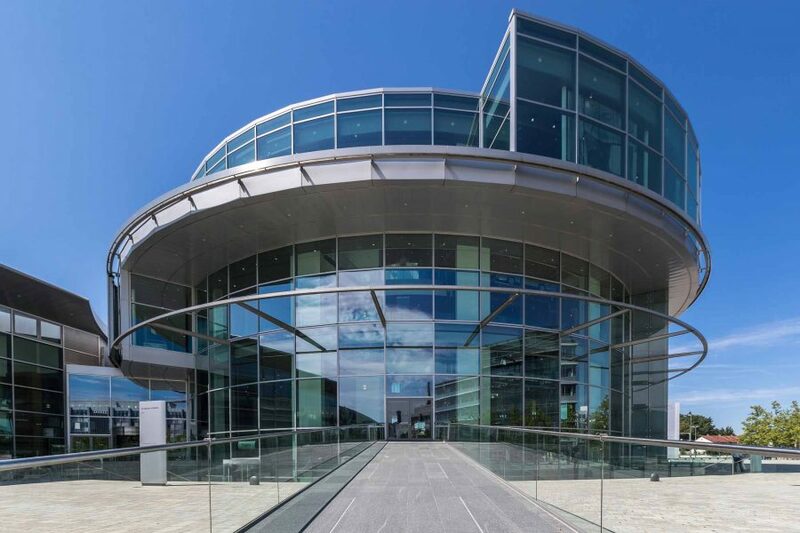 Situated right in front of the main Mercedes-Benz production premises in Stuttgart-Untertürkheim and not far away from the Mercedes-Benz Arena, this museum presents and documents the history of the automobile and the myth of the brand Mercedes-Benz. Here the Mercedes-Benz legend can be experienced – from past times to the future. 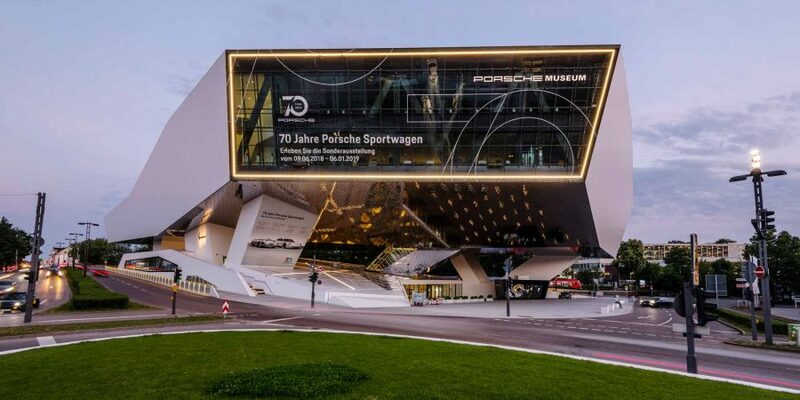 The fascinating helix structure of the Mercedes-Benz Museum blends naturally with Stuttgart`s surrounding hills, while its height of almost 50 meters makes it a landmark visible from afar. On a total area of some 16.500 meters spanning 9 different levels, the exhibition documents all the important milestones in the Mercedes-Benz history. In the Audi museum mobile, historic exhibits and modern forms of presentation create a dynamic symbiosis that allows visitors to stroll through the past for an experience that is as informative as it is entertaining. Behind the fully glazed façade, the exceptional architecture follows the principle of the growth rings on a tree trunk, symbolically uniting perpetuity and change. The corporate history of AUDI AG is portrayed, as is the rapid technological progress experienced in automotive engineering. Embedding the exhibits within the underlying economic and social conditions makes the museum mobile much more than a purely technical museum: A visit also becomes a fascinating review of the 20th century with its momentous changes.